Dried white or yellow corn kernels that have been soaked in lime or lye to remove the hull and germ. It is available canned or dried. Ground hominy is used to make grits. Hominy is a food which consists of dried maize kernels which have been treated with an alkali in a process called nixtamalization. Lyme and ash are highly alkaline: the alkalinity helps the dissolution of hemicellulose, the major glue-like component of the maize cell walls, and loosens the hulls from the kernels and softens the corn. Some of the corn oil is broken down into emulsifying agents, while bonding of the corn proteins to each other is also facilitated. The divalent calcium in lyme acts as a cross-linking agent for protein and polysaccharide acidic side chains. As a result, while cornmeal made from untreated ground corn is unable by itself to form a dough on addition of water, the chemical changes in masa allow dough formation, which is essential to the ability to fashion dough into tortillas. Also, soaking the corn in lye kills the seed's germ, which keeps it from sprouting while in storage. Finally, in addition to providing a source of dietary calcium, the lyme reacts with the corn so that the nutrient niacin can be assimilated by the digestive tract. While consumption of untreated corn is a risk factor in predisposition to pellagra, the risk is dramatically reduced or eliminated by nixtamalization. The process of making hominy is also called nixtamalization and the ground product can be called masa nixtamalera. In Central American and Mexican cuisine, masa nixtamalera is cooked with water and milk to make a thick, gruel-like beverage called atole. When made with chocolate and sugar, it becomes atole de chocolate. Adding anise and piloncillo to this mix creates champurrado, a popular breakfast drink. The English term hominy is derived from the Powhatan language word for prepared maize. Many other Native American cultures also made hominy and integrated it into their diet. Cherokees, for example, made hominy grits by soaking corn in a weak lye solution obtained by leaching hardwood ash with water and beating it with a kanona, or corn beater. The grits was used to make a traditional hominy soup, a hominy soup that was allowed to ferment, ornbread, dumplings, or, in post-contact times, fried with bacon and green onions. Some recipes using hominy include pozole (a Mexican stew of hominy and pork, chicken, or other meat), hominy bread, hominy chili, hog n' hominy, casseroles and fried dishes. Hominy can be ground coarsely to make hominy grits, or into a fine mash (dough) to make masa, a dough used regularly in Latin American cuisine. Many islands in the West Indies, most notably Jamaica, also use hominy to make a sort of porridge with corn starch or flour to thicken the mixture and condensed milk, vanilla and nutmeg to taste. Rockihominy, a popular trail food in the 19th and early 20th centuries, is dried corn roasted to a golden brown, then ground to a very coarse meal, almost like hominy grits. 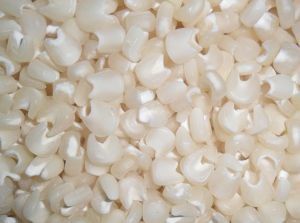 Hominy is also used as animal feed.